As the legislative session has reached a 2-week intermission, I’d like to update you on some items both I and the Republican Caucus have dealt with in the General Assembly recently. House Bill 3213. In further service to Illinois’ veterans I presented House Bill 3213 to the Veterans Affairs Committee last week, in which it received unanimous approval from committee members. The legislation will increase accountability and clarify legal authority within the Department of Veterans Affairs. The bill requires that Veterans Affairs can now maintain a volunteer group force that may include representatives without limitation or constraints from any educational institution, labor organization employer, church, or farm organization. It adds that a veteran or spouse of a veteran, once admitted to an Illinois Veterans Home facility, is then considered a resident for inter-facility purposes should they require skilled care. It also allows the Department of Veterans’ Affairs to conduct fundraising to benefit a Veterans’ Home’s member’s benefits fund, and it adds that the Department may operate cemeteries at the Manteno Veterans Home and the Quincy Veterans Home. This official recognition by the State of Illinois will allow these two Homes the opportunity to seek Federal funds for cemetery upkeep. With the full support of the Department of Veterans Affairs, this legislation was drawn with the input of veterans to ensure that we do our best to serve those who served our country. Once session reconvenes, my hope is that House Bill 3213 will be received well on the House Floor. Governor Rauner & General Assembly take steps to resolve FY15 budget shortfall. Faced with a $1.6 billion FY15 budget deficit upon taking office, Governor Bruce Rauner almost immediately asked for executive powers to reorganize spending and enable the State to get through the fiscal year, which covers spending needs through June 30, 2015. The House vote on HB 317 was 72-45-0 and the House vote on HB 318 was 69-48-0, with all House Republicans voting in favor of the measures. The Senate followed up by approving both bills on Thursday, March 26, sending the measures to Governor Rauner for final action. The Governor, who pushed for and signed both bills into law, expressed a readiness to follow up on this work in alliance with House Republicans. The two bills became law as Public Acts 99-0001 and 99-0002, the first bills signed into law by the new Governor. As I’ve stated before, actions such as these became necessary under the shortfall inherited from Governor Quinn, and I along with the rest of the House Republican Caucus will remain open to the needs of the Governor’s Office to maintain the state’s vital services where necessary. House panel hears FY16 revenue estimates. The House Revenue and Finance Committee heard testimony on Friday, March 27 from the Commission on Government Forecasting and Accountability (CGFA), the Governor’s Office of Management and Budget (GOMB), and the Illinois Department of Revenue (IDOR) on expected State revenues in FY16, the spending period that will begin on July 1, 2015. House committees advance 512 bills to floor. Including action in “committee deadline week,” which ended on Friday, March 27, the Illinois House advanced 512 bills from committee to the House floor in the 2015 spring session. House committees began meeting in February to take testimony and hear advocacy from witnesses, proponents and opponents for and against the measures filed by House members. This work was finished up this week. After the conclusion of the two-week “Easter break,” the House and its committees will consider floor action and amendments to the House bills that advanced out of committee. The House will also start looking at bills coming over from the state Senate. Illinois helps U.S. Navy prepare for launch of new submarine. The capital ship, which will be called the U.S.S. Illinois when it enters commissioned service, is in the final stages of being fitted out on the East Coast and is expected to be launched later in 2015. Chicago business leaders are helping train two key members of the crew – the culinary specialists who will man the submersible boat’s tiny galley. Physically slightly smaller and with smaller crews than the armored battleships that were once the backbone of the U.S. Navy, an attack submarine like the U.S.S. Illinois is in some ways even more heavily armed. A crew of 145 to 150 men will sail on a six-month tour of duty, much of which will be spent submerged. Modern technology even allows submarines to communicate with naval headquarters while deep under water. Although the Illinois is only 370 feet long, the “silent service” believes that American submarines serve as the ultimate deterrent to potential enemy action. The Illinois will be the first U.S. Navy capital ship to bear this name since an obsolete battleship commissioned in 1897. Efforts to build a new American super-battleship in the 1940s to carry on the heritage of the Prairie State did not survive the end of World War II in 1945. The Aurora-based U.S.S. Illinois Commissioning Committee is leading fundraising efforts to properly celebrate two separate events: the new vessel’s approaching launch and its commission. On Wednesday April 1st, I attended the Dedication of the U.S.S Illinois at Navy Pier in Chicago. I have been travelling around the district and the state during the legislative break, with added district office hours in Monmouth from 10AM until 2PM on April 8th. 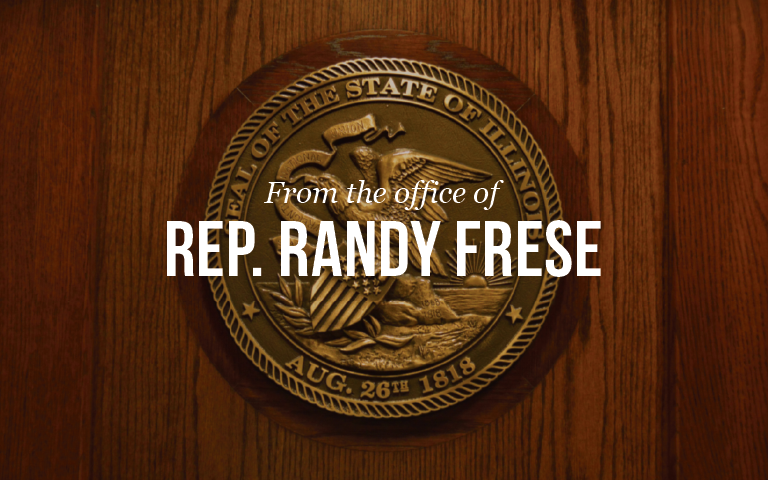 Please feel free to come see me, and as always if my office can be of assistance to you, please feel free to call (217) 223-0833, or contact me through my website at www.repfrese.com.